Currently you can buy many books with various mandala templates. They are usually thematically oriented. The advice on how to choose the right mandala set is simple: Take the one you like the most! Choose your mandala based on which one you catches you at first sight and which you really like. Even a blank paper with circle on (or with no circle at all) can be a template! Choose a technique you will follow - from the center to the edges, or from the edges to the center and follow this direction during the whole process. By doing so you will be able to calm down your mind, which otherwise constantly wanders from one thought to another. Remember; this is not about the result but about the creation process! There is one rule for drawing mandalas: the harder you try, the worse it gets and the less satisfied you are going to be with your results. 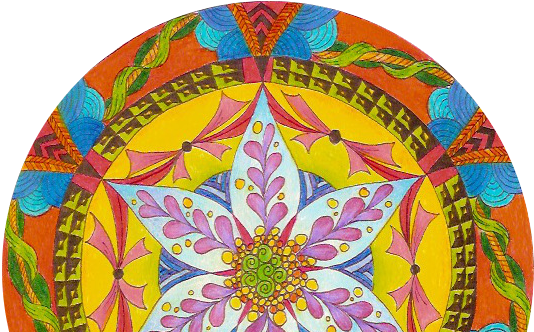 Finally, before putting your mandala away, close your eyes for a moment and evaluate the time you spent with your mandala – was it easy to “find” your mandala? What colors and shapes have you chosen? Did something distract you? What were your feelings during your work? Then, in order to finish the process, you may give your mandala a name. Name after everything you have experienced together. Note that name together with the date on the back side of the mandala – thus, creating a “mandala diary” you can go back to anytime for reviewing your feelings. Sometimes it is beneficial to observe the mandala for a few days, letting it affecting us and sometimes it is helpful to destroy it (tearing, burning…). Tibetan monks for instance, believe that mandala’s energy is truly released only after it is finished and destroyed. On the contrary, some mandalas serve as a two dimensional model for real mandalas which come into existence in our inner world while meditating and give us the opportunity to understand the order of the outside world. It coul be inspiring to draw in an opposite direction than we are normally used to. What is it like to draw a mandala zig zag, without any rules (such as following a certain direction), to choose specific colors (eg. only the warm tones) or to use your crayons with your eyes closed...? No matter what approach you choose, be aware of your emotions and of what is happening. If you need a healing picture, a supporting mandala, an item of harmonization or a tool for communication with other beings, put your intention (your decision about the purpose of the mandala) into the mandala instead of your feelings. Pronounce it briefly and positively! Consider everything you will ever read about mandalas, including these “instructions”, to be just an inspiration, not a dogmatic rule! Because what is true for one or the other person does not necessarily apply to you. And who else is this all about if not you? Look for your own path or direction and discover all the new possibilities which are beneficial for you. Nobody else has the power to help you except you yourself.